I love crafting gifts! There’s nothing like making something a little personal for the ones you love. 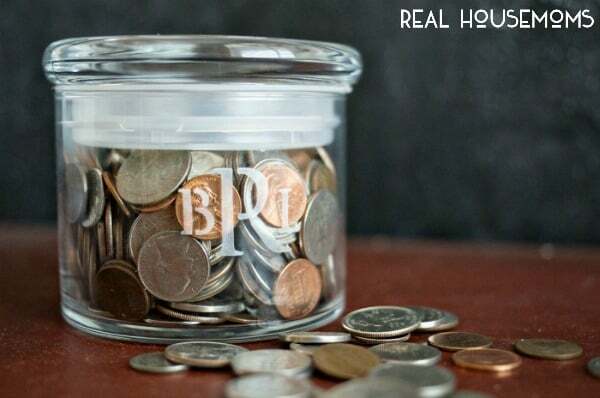 A few years ago my husband received a glass coin jar as a gift and I was surprised about how much he used it; it sits prominently on his desk. 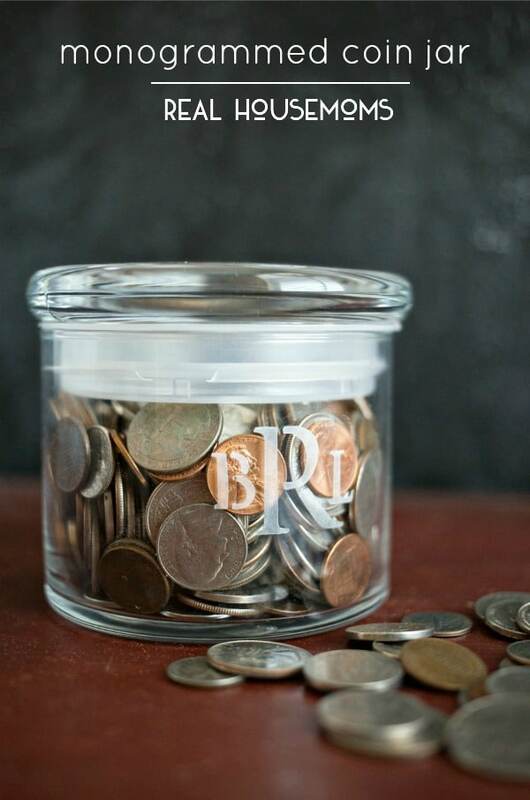 So when it came to thinking of great DIY gifts we could craft for Father’s Day, I thought it would be fun to create a personalized Monogrammed Coin Jar! I love monogramming things – maybe as much as I love mason jars! There’s just something about that personal touch – on handkerchiefs, towels and more! And with a little etching cream, it’s simple to add a monogram to glass in just minutes. I’ll show you how! Choose your monogram adhesive stencils. 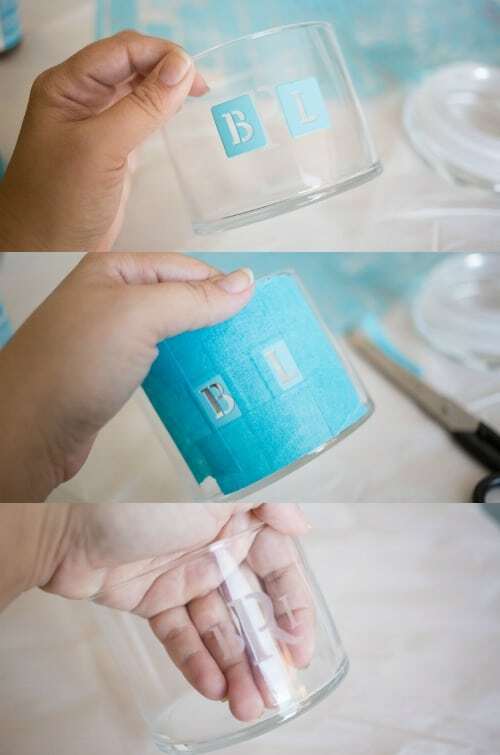 Starting with the last name initial, center the sticker in the middle of the jar. 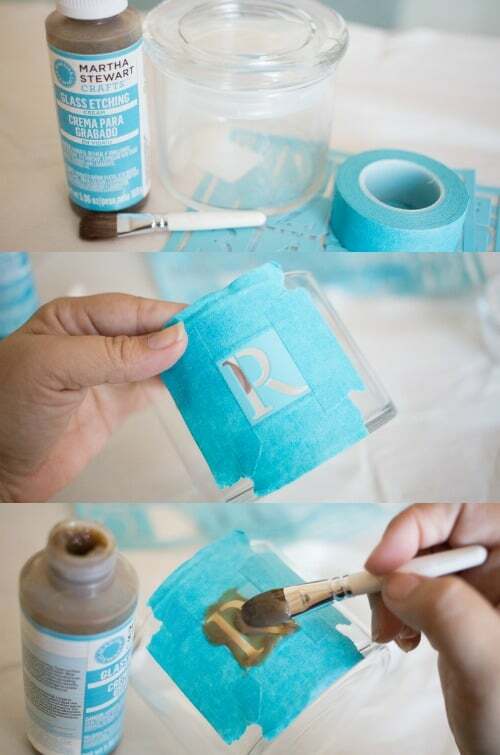 Secure the stencil and protect the outer portion of the stencil with stencil tape. Using a paintbrush, apply a thick layer of etching cream and leave for 15 minutes (or according to directions on etching cream). After the time is up, wash the etching cream off the jar with water and remove the tape and stencil. Next, you’re going to add the first and middle initial adhesive stickers on each side of the first initial. I chose a smaller stencil so that the last name is more prominent. Add more stencil tape around the stencils to secure the stickers and protect the outside of the stencil. Once again apply etching cream and wait 15 minutes. Wash the etching cream off with water and remove tape and stickers. 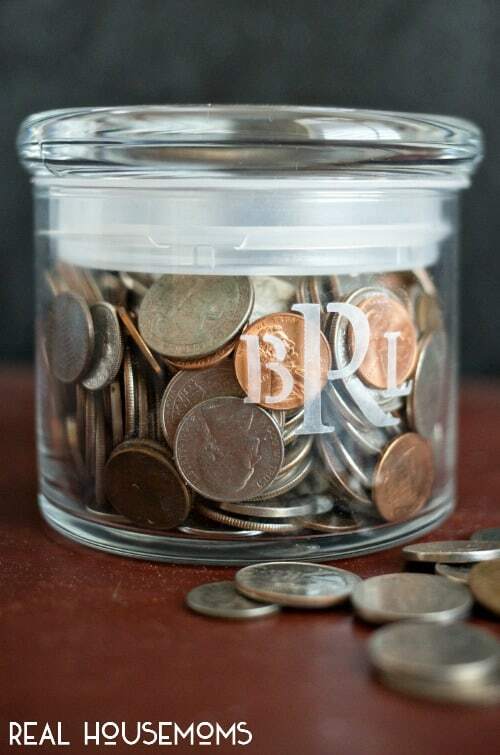 And there you have it – a personalized Monogrammed Coin Jar in just minutes! Now this gift is the PERFECT gift for those dads or grandpas who collect coins or have a little drop zone for all the goodies in their pockets at the end of the day. If you enjoyed this quick and easy craft, be sure to head over to A Night Owl for more! If you’re looking for more easy craft ideas, check out our collection of Father’s Day crafts! Say hi if you drop by!